On-Site auctions are our specialty! We do auctions at your site! As of Dec 2nd 2014, the Auction Block Plus has been known as “The Auction Block UP”. Scott Bellville, a lifelong resident of the Manistique area has purchased the business and has now taken over as owner and auctioneer. 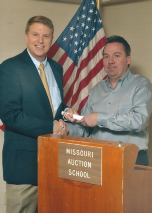 Scott attended The Missouri Auction School to become a nationally accredited auctioneer. The Auction Block UP will continue to offer great quality and customer service.